Unfortunately, not accessible to the general public, this form of sauna was used in the treatment of rheumatism. It is a small beehive-shaped stone house with a low entrance. A turf fire was lit inside and kept lit until the interior was heated all over. The fire was then extinguished and the patient, wrapped in a blanket, went in and sat down. The entrance was sealed except for an air hole. After some time the perspiring patient came out and dipped in the stream. The treatment was undoubtedly enhanced by the copper in the water, there are copper mine shafts of the 1800’s in close proximately. On the right hand side of the village, where two roads meet, stands the former Royal Irish Constabulary (RIC 1836 -1922) barracks, refurbished in the late 1980s as a private dwelling. The road to its right leads to viewing points at Piperhill and Glencarbery beauty spots. The quarry on the left further on is of scientific interest because of ‘an outcrop of fractured Wenlocklan (Silurian) rock exposed – a rare occurrence in Ireland’. Look out for the sign beside the Metal Bridge in the village, which informs you that this area is the burial place of Éamon an Chnoic/Ned of the Hills. He was murdered in 1724 for the reward on offer for his capture. His head and body were reputedly buried in separate graves, 1840s’ lore pinpointed a site in Curraheen townsland as one of the burial places. Today, Hollyford village comprises a supermarket, pubs, credit union office, community hall, sawmill and a former independent co-operative creamery. Hollyford is part of the ancestral home of the O’Ryans and forms a stage of the Beara-Breifne Way which is based on the historic march of O’Sullivan Beara in 1603. Tipperary Multeen Tourism Co-Op Society Ltd.
We’ve created a unique walking passport you can use to catalogue your progress over days, months or even years. Each community has chosen a stamp to represent its character, and as you collect your passport stamps, you’ll get to meet some of the people behind the walk’s creation. 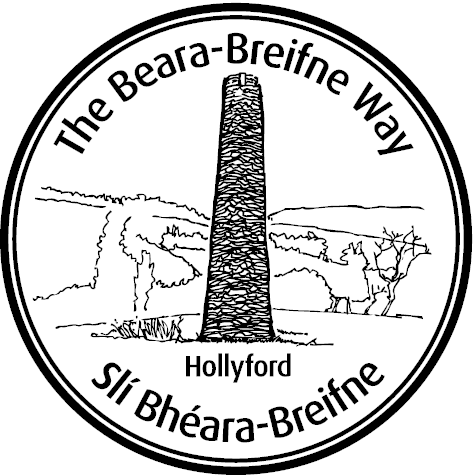 You can order your Beara-Breifne Way passport online and plan your route using our handy maps. Stamp locations are listed on on this website for each walk and walk section. When you complete your walk, call in to its passport point, and we’ll stamp your passport for you. At the end of your journey, you can claim the final stamp which proves you walked the entire Beara-Breifne Way! Communities from the tip of West Cork to the top of Cavan gathered in Roscommon yesterday to launch the new passport and community stamps visitors can use to track their journeys on the Beara-Breifne Way. Today the Beara-Breifne Way has its launch! It's creation is a great tribute to the communities along Ireland's longest walking route.